With April comes the first signs of spring here at Knotty Toys for Good Dogs. The nights may still be cold but everyday I see more of the earth as the snow melts away. Hi everyone, CEO Olivia here with a few reminders of what comes with the warm weather. First, if your good dog hasn’t been active over the winter, it will take some time to get back into shape. You might want to take play time slower at first. You’re walks can get longer over time but you might need to work up to it. Once your out on the trails, you might discover things that have been buried in the snow that aren’t ideal to touch or eat. Garbage, rotting twigs or food wrappers should all be avoided. We found a dead porcupine & I got a poke in the nose for my curiosity. Puddles of melted snow should not be drank because they might have toxins like road salt, antifreeze or even parasites. Also, stay off ponds or lakes. The ice may look solid but why chance disaster? The melt off can also cause flooding & fast moving waters. Flowers will be popping out soon. 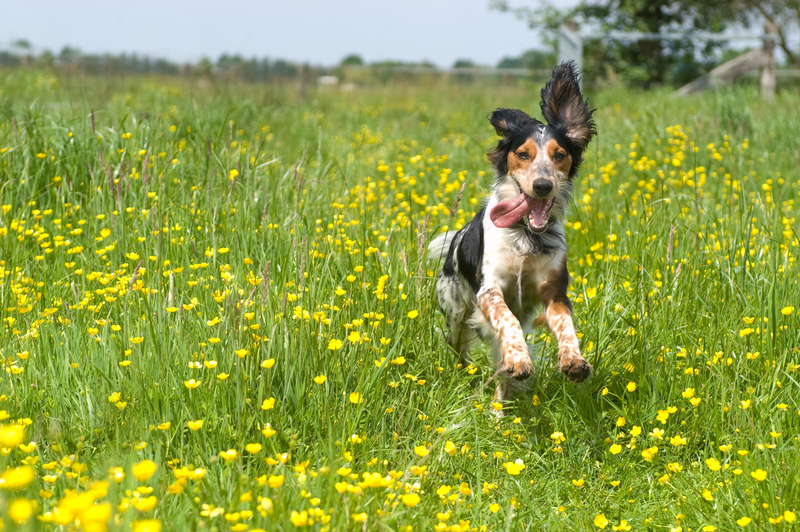 Your good dog can get allergies from pollen just like you. A vet recommended, over the counter antihistamine or a natural antihistamine. Speaking of flowers, lilies, azaleas, sago palms & rhododendrons are very toxic to dogs. You might want to avoid planting them were a good dog could accidentally munch on them. Also with spring comes fleas & ticks. You should consult your vet about taking a flea & tick preventative. Even if you’re in a city, always check your good dog for ticks after a romp outside. Should you find a tick it will be easier to remove if it hasn’t burrowed in yet. We have a small plastic tick remover that can remove a them, head & all. You can get one at a pet supply store or your vet. Where I live there is a risk of Lyme Disease. You can check online if you live in a high risk area. If you do & find a tick, put it in a jar or pill bottle & get it to a vet where they can test it. Also, if you’re not sure if you got the head out, you should see the vet to be sure, it can become infected. Never squeeze the tick, it will vomit into the wound & that’s not good either. Finally, if you live rural like me, there are lots of critters waking up from a long winter. Skunks, porcupines or raccoons don’t make for good play dates. Always supervise your good dog & keep it on leash unless you’re at the dog park. Have a safe, wooftastic time out there. I’m off to examine some newly uncovered stinks.